You too Clowie! Although with your pretty white coat you can handle the cold better than I can! We are heading south – hoping to get out of town before the snow hits here! Stay warm, and stay away from the monster in the closet…hugs to you and your Mom! Oh have a fun trip Miss Linda – drive carefully…..I promise to behave myself (tee hee). Take lots of pictures on your trip (I didn’t really need to tell you that did I?!?!?!). They’re both pretty badges. If I can get Motor Mommy to work on OUR awards, I’ll have her grab them. But I don’t know about that snow…..I would like to watch it from my window seat, though! Hi Sundae………WATCHING it is way better than BEING in it I think…..When I was younger I liked playing in it though. Thank heavens for window seats so we can at least OBSERVE winter! It’s kind of silly that they close schools with so little snow BUT where we are there are a lot of hills and trees so the snow just doesn’t melt….it hangs around FOREVER and gets icy so it’s dangerous for school buses (and kids walking!). Housecleaning is over and I am always happy to have that protective suit – it comes in handy for the litter box! Surprise snow is sometimes lots of fun, especially if you have a cozy basement to stay in! Have a wonderful day and congrats on the award! Thanks Miss Katie and Cocco! Still waiting for the “surprise” to start falling for today……we ought to have another few inches of snow before the day is over! Happy Friday! Sammy, I’m packing my suitcases and am heading your way!!! Hi Savvy……I managed to avoid the monster today – basement works quite nicely and I can keep an eye on the outdoors from my spy chair by the door at the same time. I’m looking for that snow they said would come today! Great awards you got there. Oh dear, basement time – hang in there, it’ll be over soon. Basement time is over….now I’m on “snow watch”…..they say it’s coming and I think it just might – it’s overcast, super cold, AND it smells like snow! Hope you’re enjoying your basement time…can you see it snow from down there? It’s attempting to snow here. Such itty-bitty flakes that it’s not really accumulating much but at least it’s trying! Hi Miss Dee! Yes – I can see outside in the basement. Mom has a chair with a nice warm blanket on it that she keeps RIGHT in front of the glass doors outside. Perfect “spy spot” for me….I can see snow, birds, squirrels and other yard intruders from there. So far no more snow but it FEELS and LOOKS like it’s coming! I don’t have a window seat to watch the snow but I sure will be watching it from inside IF the weatherman is right for once. Sometimes I think they’re just guessing about what the weather will be. They did get one thing right ….IT”S COLD!!! Hi Miss June! I think they guess ALL THE TIME on the weather but you’re right – maybe it WILL snow and maybe it WON’T but one thing’s for sure – it LOOKS like it’s going to! Hopefully you don’t have to hide out for too long – happy weekend! I hope you and Eko have a super weekend too Mr. Will! Housecleaning is DONE and we’re all just hanging out waiting for more snow! We agree with you on the basement deal. Well, 2 out of 3 kitties do at least. The third (Maxwell) thinks housecleaning is COOL and wants to be in the middle of it. We told him if he could HEAR the OUTRAGEOUS noise that machine makes he’d be hiding too. But hey, to each his own! We’re getting like 10 snowflakes later on today. Not nearly enough to make me lose my mind. How annoying. I wish I had a basement. I’d go down there and sulk. Oh Poor Cuppycake! You know if you don’t have a handy dandy basement like I do, a closet or under a bed works fairly well! It’s snowing fairly decently here right now…….YUCK. Concatulations on your award, Sammy! It IS very pretty! 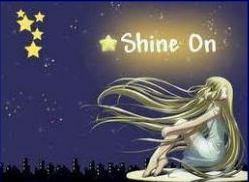 Thanks Sparkle……Seems to be that a pretty kitty named “Sparkle” ought to have a Shine On Award herself!! Feel free to take it if you’d like to! Aren’t they great awards Sammy? I love the dreamy one and I love Misaki’s coz I don’t have to go into snow to get it! Hi Zena! 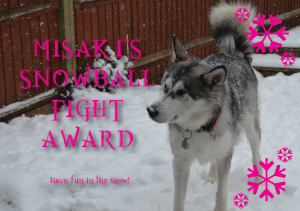 I agree about Misaki’s award – that’s my kind of snow – the “looking at and not being in” kind!! The Shine On is just plain BOOOOOOTIFUL! Happy Weekend! Hi Lee and Phod – I DID have a great Friday and Saturday’s shaping up nicely too….bacon…..fireplace…….cozy toesies! Uhoh…..Misaki stole your snow? That’s not NICE! I didn’t know you were THAT close to where she lives but how nice – you two should have a playdate in HER snow! Facebook is a pain in the (OOPS, can’t say that or Mom will get mad)…..anyway it’s sometimes difficult to get anything DONE on FB. Labor-intensive Mom says. Plus she hardly ever has time to go there since my blog and visiting everyone else takes a lot of time! Hope you get MORE SNOW! Hi Misaki……ice is no fun – and it’s ever so dangerous compared to nice fluffy snow – no wonder you couldn’t catch it! I think it would be wonderful if you and Mollie could go play on the beach together….Who doesn’t like to see a couple of pretty ladies on a beach????!!!!! That white stuff! Would be a lot more fun if it’s wasn’t so cold, you know? CONGRATULATIONS on your awards! Yow Sammy: We haz had alot of snow here in Canada…but now it iz 40 F n da snow iz meltin. Mum sayz dere iz a bad storm comin our way dat will make it cold n den it will get bery icy!!! Me iz so glad to be a house kitteh!!!! Sowwy we hazn’t bin around; Mum iz havin sum health probz n me iz nursin her back to guud health!! !